First Pull (#1-3) begins as barbell is lifted off the ground and ends when the knee reaches first maximum extension (Gourgoulis, 2000). The knees and hips are extended during this phase while the ankles are plantar-flexed but the entire foot remains in contact with the ground. The trunk should be held at a relatively constant angle in relation to the ground (Barnoletz, 1996). Transition aka Knee Bend (#3-4) begins at first knee extension maximum and ends at maximum knee flexion (Gourgoulis, 2000). The knees are pushed anteriorly towards the barbell and flex about 20° during the phase while the hips continue to extend (Barnoletz, 1996). Second Pull (#4-6) begins at maximum knee flexion and ends at the second maximum knee extension (Gourgoulis, 2000). During this phase, the ankles are plantar flexed and heels raise off the ground (some debate about this in the Oly world) while the knees and hips continue to extend (Barnoletz, 1996). 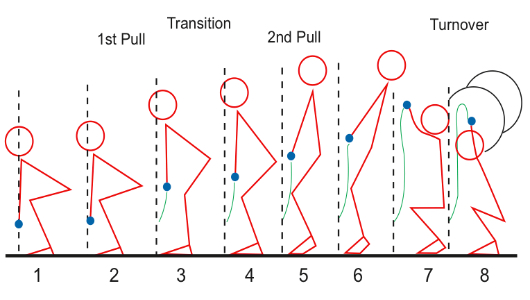 Turnover (#6-7) phase is from the end of the second pull until the barbell reaches its maximum height (Gourgoulis, 2000). During this phase, the lifter begins to move their body downward and begins to reestablish full foot contact with the ground (Barnoletz, 1996). Catch (#7-8) from maximum barbell height until the barbell is stabilized by the lifter overhead (Gourgoulis, 2000). Feet are in full contact with the floor and the arms are locked overhead (Barnoletz, 1996). Rising begins after the catch and ends by rising from squat position (Barnoletz, 1996).